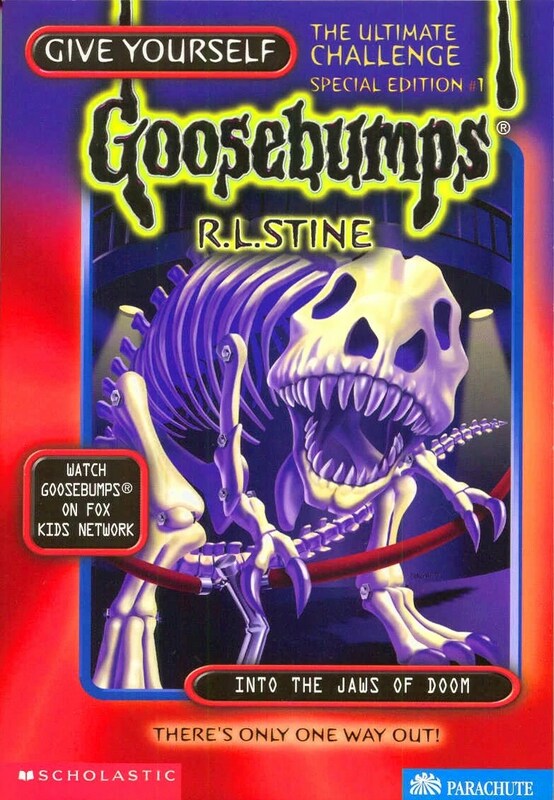 The Goosebumps books are one of the most popular things 90’s kids talk about. There are a lot of funny and great reviews on the internet analyzing and critically reviewing this horror series for kids. 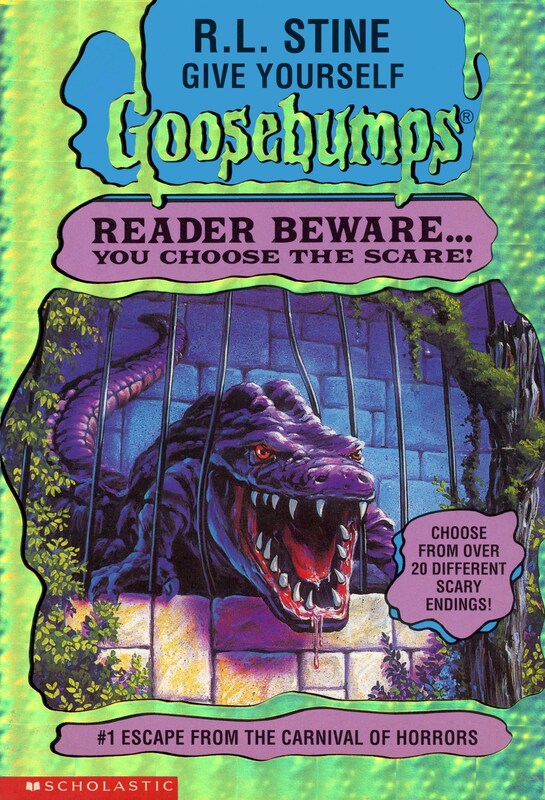 But one thing I noticed is that though people may talk about the books and its rather awfully made tv-series, few consider the Choose Your Own Adventure-style series, Give Yourself Goosebumps. I actually prefer GYG over the original series mainly because they were just so fun to read. Reading them was almost like playing a video game as you want to achieve 100% completion even though it wasn’t necessary. I’ve always associated GYG loosely with October. Not just because of the scary aspect but every October, my local public library would have a used book sale. I liked to look through the filled-to-the-brim bookshelves and smell that nice old, book scent. The book sale was always partially outside though underneath these big tents that sheltered the books. As such, you had to wear a jacket and try to stay warm despite the cool temperature. It was at these books sales when I was introduced to GYG. I’m not one to usually collect things save bowties, vests, and other dress clothes, but the GYG was an exception to this. Every time I would go to the book sale, I would buy all the GYG books I didn’t have even if they were below my age range. They were that entertaining. Anyone who has read a Choose Your Own Adventure book will instantly be familiar with a GYG book. You have a series of choices to make as you progress through the story. Some decisions will take you through different plots while others can spell doom for you. Your decisions have a crucial impact on the story and can determine if you come out okay or not. GYG takes that concept and plays with it. Most of the endings can lead to your death, even if it’s not explicitly stated, or lead you trapped in some horrible situation. There are only a few “good” endings and even then these can be not that pleasant (in true Goosebumps fashion). The GYG books usually have two main plots that are determined fairly early on. I find myself favoring one of these plots over another though this could be due to selective bias. You can’t really blame me though, right? After going through one plot and learning about your protagonists and antagonists, you have to retread old ground and relearn the characters again as they are different a second time through. It irks me but hey, that’s a choose-your-own-adventure format for you. I would say the books that do this the most for me are Creepy Creations of Professor Shock, Your Plant Food, and Shop Til You Drop…Dead! Creepy Creations needs a special mention because of its weird, mirror universe storyline. You’re basically transported to a mirror world, like Carrol’s Through the Looking Glass, and you have to survive the world using backwards logic, it’s pretty great. One thing GYG does, particularly later in the series, is incorporating items into your quest. You had to keep track of your items along the way and know when to use them in certain situations. Most of the time, you’ll use the wrong item but when you use it right man does that feel good. This use of items I believe first appears in one of my favorite GYG, Shop Til You Drop…Dead! It actually ties into why I like one plot over the other. In one of the plots, you have to survive the different floors of the mall and find an item associated with that floor. It’s really fun and you even had to go to certain floors first to find an item that will help you survive on a completely different floor. The problem with the items is that the reader can cheat and pretend they have a certain item in order for them to succeed when they would otherwise fail. It’s not like the author or book is going to call you out on it. That was my thought until I read Trick or…Trapped! (one of the last books in the series) where it straight up calls the reader out for cheating. I can’t remember what it was, but during the final scene of the game, you are asked to do a task and asked if you have this item or not to complete it. The twist is that the item doesn’t actually exist! When I read the choice I was quite confused because I hadn’t recalled coming across that item before and I was wondering how I missed it. Curious, I turned to the item’s page number and was amused to see that the book called you out for cheating and your character died from the monster. Truth be told, it would be a definite stretch to say that all of the books are good. They are, at most, passable. The books I mentioned in this article are the ones you should go for if for whatever reason you wanted to read them. Actually, the final book I want to talk about is probably the most infamous one, Into the Jaws of Doom. This book is thick relative to the other books. It was the first special edition book in the series. I have to say, when I first bought it, I immediately realized this was a special one. Not just its size but how it boasted there was only one good ending in the entire story. The book was straight up challenging the reader to beat it. It even had a special warning about the nature of this book and how you need to keep track of your inventory as well as a pair of dice on hand. And let me tell you, this book was hard. Everything you knew about GYG and its stakes rose two levels. The trickiest part was keeping track of your items and knowing when to use them. Some of the items were totally useless as well. The science museum setting was an excellent place for crazy things to happen. Probably the worse foe in that book was the “Visible Man,” that guy was nuts. There’s just no other book like it in the entire GYG series including the other Special Editions as well. Unfortunately, I haven’t read all of the books in the series, particularly those in the Special Editions, but hey, the library book sale is this week, with any luck, maybe I’ll find a new book and give myself some goosebumps. This entry was posted in books and tagged Books, choose your own adventure, Give Yourself Goosebumps, Goosebumps, Horror on October 27, 2014 by Andy. Great writeup. I’m 30 now, and I still read GYg =D they’re just so entertaining, like you said, like playing a videogame. Carnival of horrors and prof shock are two of my favourites as well. Along with Trapped in Batwing Hall.